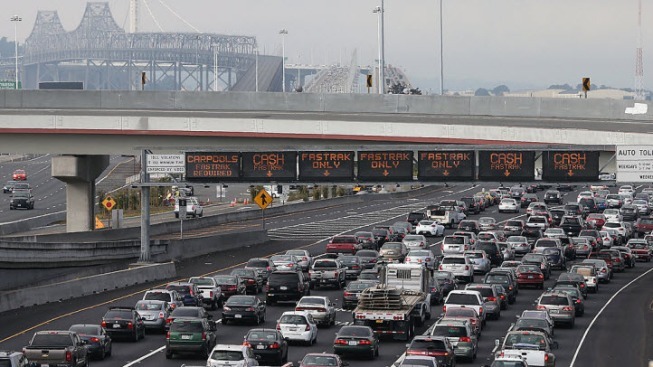 Traffic backs up on Interstate 80 at the San Francisco-Oakland Bay Bridge. Don't be surprised if San Francisco and Oakland feel more cramped. It isn't a well kept secret that the Bay Area is one of the United States' most expensive places to live in. Even so, the population of both metros has spiked, according to a recent California Department of Finance report that shows that San Francisco and Oakland are packed with more people than ever before. San Francisco is now home to 874,227 people, gaining 9,000 residents from last year, according to Hoodline. Oakland's population has reached 426,000, up 7,000 people from 2016. By 2030, San Francisco’s population is expected to leap to a million, the report forecasts. Across California, the number of housing units built in 2016 — 89,000 — was 31 percent more than in 2015. Of those, 5.75 percent or 5,114 new homes were completed were in San Francisco, the report says. The state now offers 14,071,000 homes in total — another record high. The state's population swelled by 335,000 people to an all-time high of 39.5 million. Putting that in context, the entire country of Iceland is occupied by roughly 334,000 people. Los Angeles, the largest city in California, has crossed 4 million people with the addition of 42,000 residents in 2016. It was followed by San Diego at 1,392,000, a jump of 15,000 people from last year, according to the report. San Jose retained the title of the Bay Area's largest city. An estimated 10,000 people moved to the Silicon Valley hub in 2016, boosting its population to 1,046,000. Menlo Park, where social media giant Facebook is headquartered, is the fastest-growing city, Hoodline reports. With 35,670 residents, the San Mateo County city's population is up 5 percent from the previous year and development is primarily in the form of multi-family houses, the report shows.